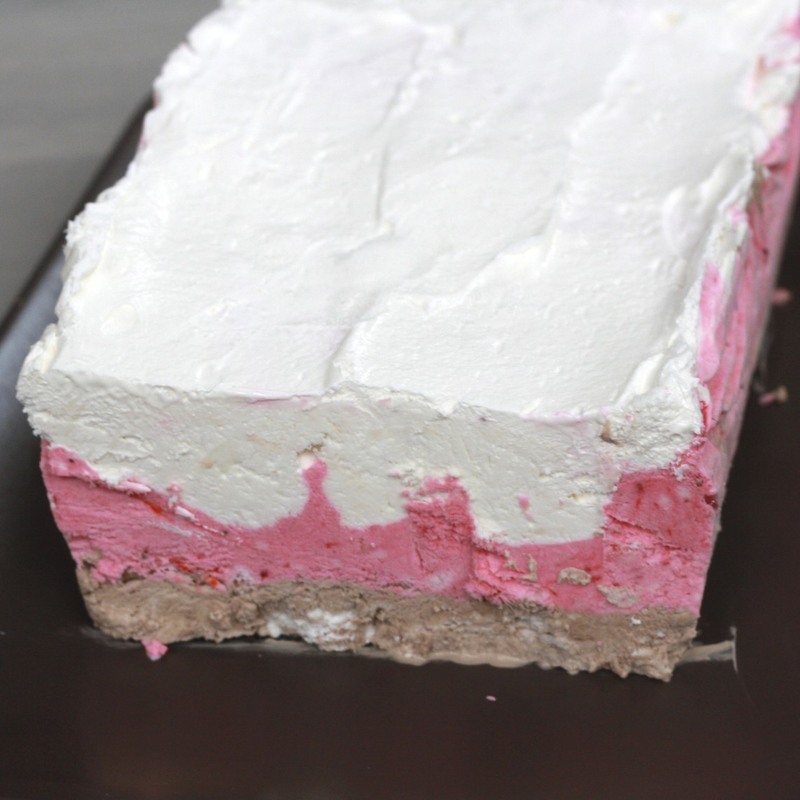 When Foodbuzz and Kraft contacted me and offered me the chance to create a recipe featuring COOL WHIP Whipped Topping, my mind immediately went to something Neopolitan. I'm not sure where this inspiration came from, seeing as I haven't had a Neopolitan ice cream sandwich (an old-favorite) in probably fifteen years. 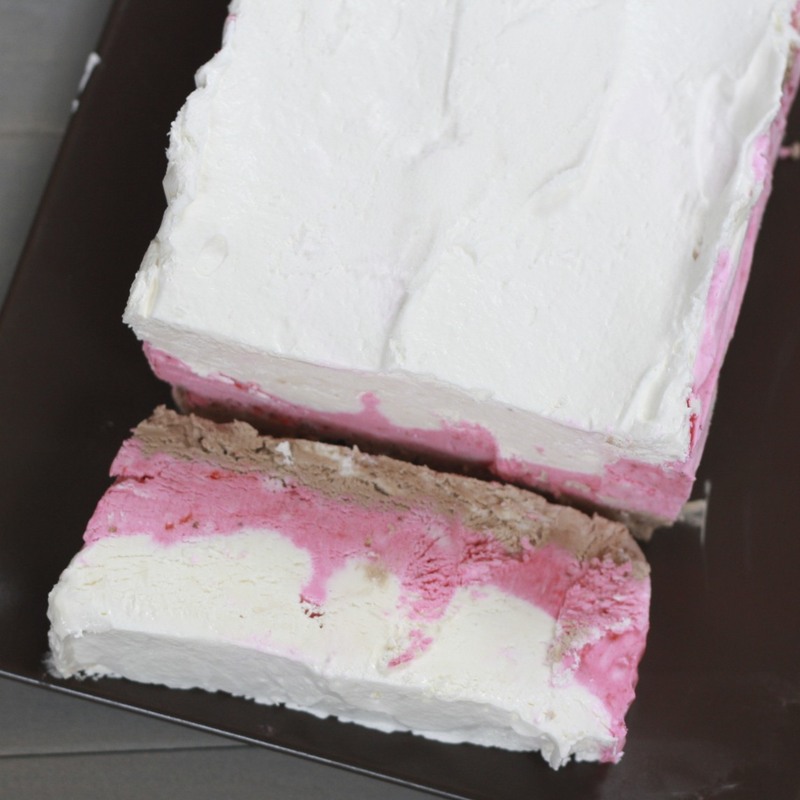 This is no ice cream sandwich, but it IS frozen, and it features all three classic flavors: chocolate, vanilla, and strawberry. Next time I might add a chocolate or graham cracker crust to mix up the texture a bit (similar to this Frozen Mocha Marbled Loaf Cake). This is a great dessert for Spring or Summer. Not only does it require minimal ingredients, but it comes together in all of twenty minutes, if that. Once made, you can then stick it in the freezer for whenever you need it...like when the ice cream truck drives by 5 times and you refuse to buy ice cream for yourself, your kids, and the houseful of neighborhood kids over at your house that day! The best thing about this cake is that everyone can eat it their preferred way--either getting a taste of all three flavors in every bite or eating it row by row, flavor by flavor. Which way would you eat it? 1. In a mixing bowl, beat cream cheese until smooth. Add confectioners' sugar and beat until creamy. Fold in Cool Whip. 2. Divide mixture by three, separating each into a bowl. In a blender, blend strawberries with lemon juice until smooth. 3. To the first bowl, add 1 tsp vanilla extract, stirring to combine. In the second bowl, add the strawberry mixture, stirring to combine (to make the mixture more pink, tint with food coloring). To the third bowl, add 4 tbsp chocolate syrup, stirring to combine. 4. Line a loaf pan with foil or plastic wrap and spray with cooking spray. Pour the chocolate mixture into the bowl, using a spatula to evenly spread it. Pour the strawberry mixture on top of the chocolate mixture, carefully spreading to cover completely (without mixing flavors). Top with the vanilla mixture, again spreading carefully to not mix flavors. Cover with plastic wrap and foil and freeze for at least six hours. When ready to serve, allow to thaw on the counter for 5 minutes before cutting into slices.